round slower in these times. Some new models had been cancelled, some postponed - while many newnesses relate to green approaches, which is another trend at the 2nd century's first decade's end. Actually it didn't appear to be a comfortable situation for auto tuning companies, but the German industry is optimistic! Instead of buying a new car, people more often opt for a refreshments, says the German tuning association VDAT. And indeed, a set of nice wheel or some add-on parts are suitable to turn an old car into something excitingly new. The tuners have lots of great stuff on store for that, and are permanently adding new items to their range! Such as Carlsson that comes out now with a new wheel option for Mercedes cars: The 1/5 Revo! The distinctive five spoke design is a bit different to the very classic rims of theirrange. Finish and design is more modern. Carlsson says that they are aiming at younger customers with the wheel. Indeed, it is likely to be more to the tastes of those who prefer trendy looks instead of classic elegance. 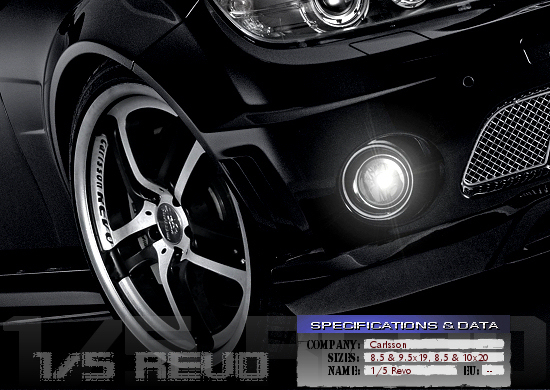 Being available in 8.5x19, 9.5x19, 8.5x20 and 10x20, the 1/5 Revo can be attached to any Mercedes-Benz car. Carlsson have got an approval of the German TÜV for all Mercedes cars except of the A-class and the SUVs.